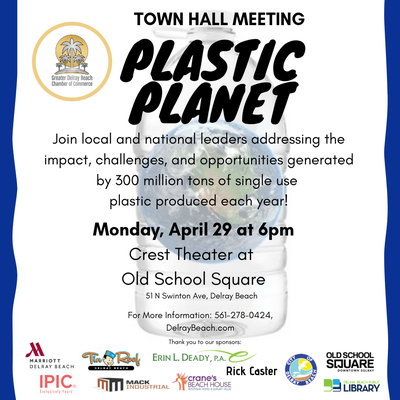 Delray Beach is holding a Town Meeting at the Crest Theater to address a significant issue to our Village by the Sea”: the impact of hundreds of millions of tons of plastic on our oceans and beaches. The Town Hall is being organized by the Delray Beach Chamber of Commerce and the City of Delray Beach. Sponsorship by local businesses and benefactors make the event possible. The Town Hall meeting promises to be an evening of discussion and discovery. We will explore the impact of plastics to date and the projected impacts in the future. Starting with clips from the eye-opening film Plastic Oceans, various experts will weigh in on the role of businesses such as hospitality and restaurants, entrepreneurs, municipalities, and not for profits, and we will close with creative steps individual citizens can take to make a difference.